Mom and I were in Cape Town for three days — we had lots to see and no car. 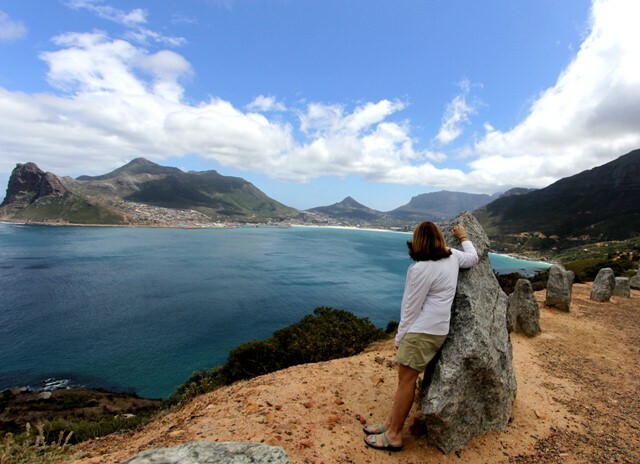 I’m usually not a fan of group bus tours, but when Mom suggested a tour of the Cape Peninsula with a company called Daytrippers, it seemed like a good plan under the circumstances. We headed south out of Cape Town and marveled at the crystal blue sea and lovely beachfront suburbs. 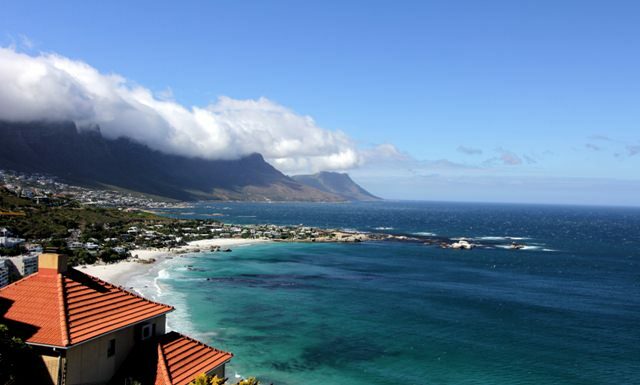 Clifton, a spectacular Cape Town suburb along the Atlantic coast of the Cape Peninsula. 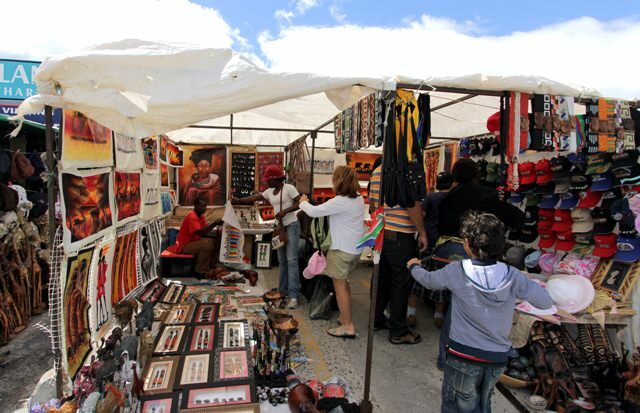 Our first stop was Hout Bay, a fishing town about 20 kilometers from the city that has become a popular tourist destination. We had the option of taking a boat to a nearby seal colony, but the water was rough due to the high winds and Mom is prone to sea-sickness. So we opted for coffee and a stroll on the wharf. 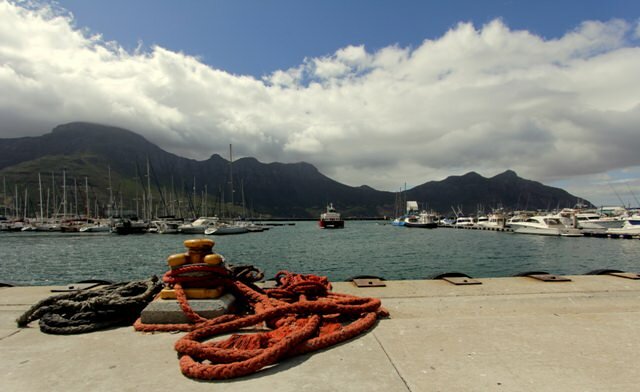 The wharf at Hout Bay. 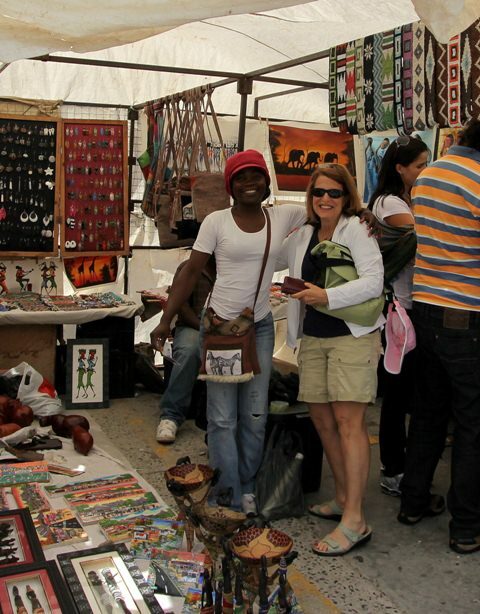 Mom walked away with two batik paintings, a small wooden elephant, and a new friend. We piled into the van and rode along Chapman’s Peak Drive, one of the most scenic roads on earth. It winds between the steep mountainside and the ocean, cutting right under the cliffs in some spots. A stop-off along Chapman’s Peak Drive. 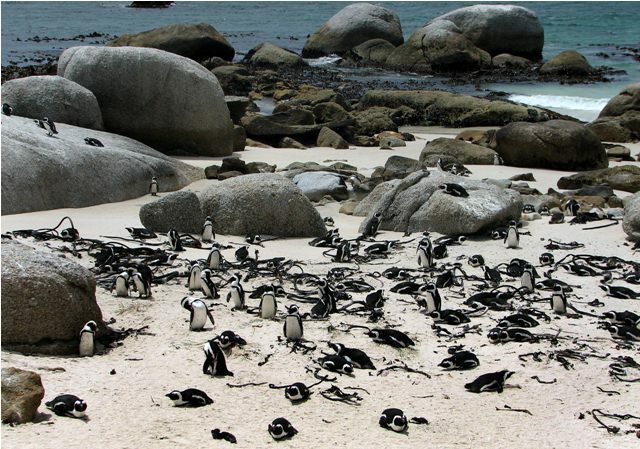 Eventually we crossed the peninsula to the False Bay side, stopping at another cute village called Simon’s Town, home of the penguin colony at Boulders Beach. There are no words to convey how cute these penguins are. It was incredibly windy and the sand was whipping into our eyes. The penguins were unperturbed. 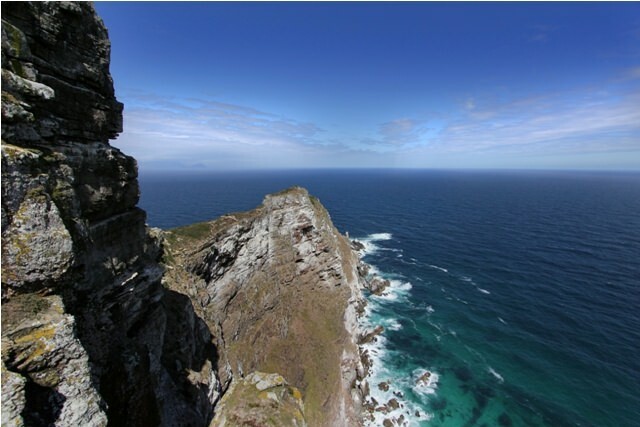 From there it was on to Cape Point and the Cape of Good Hope, where the Atlantic and Indian Oceans meet. (Well, sort of. See below.) There is nothing but ocean between there and Antarctica and it felt that way when we entered the Cape of Good Hope Nature Reserve — cloudy, windy, and desolate. We saw a few antelope and baboons, which was cool. Then we stopped for a chilly picnic lunch in the courtyard of the visitor center. The tour was supposed to include hiking and cycling, although it was hard to imagine doing either one in that wind. But as we pulled into the parking area at the Cape of Good Hope, the wind died down and the sun started shining. A few of us even climbed to the overlook above the cape. 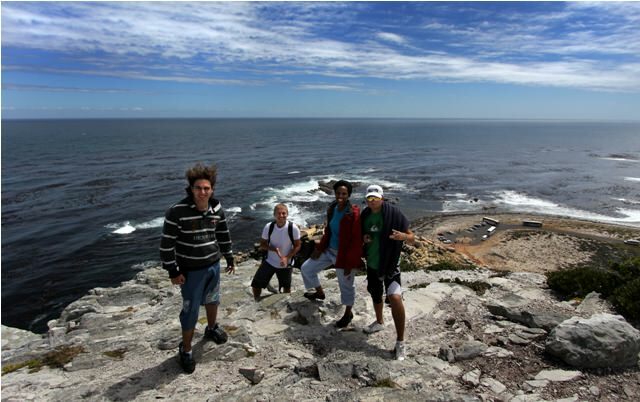 Fellow daytrippers Dawn (second from right) and the guys from Brazil (I never got all their names) at the Cape of Good Hope overlook. You can see the wind in the hair of Brazil guy #1. It was just calm enough not to blow us into the ocean. We drove from the Cape of Good Hope to Cape Point. 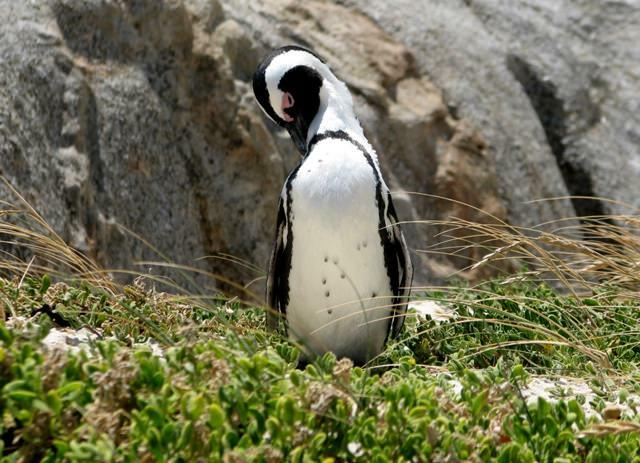 The Cape of Good Hope is the southwestern-most point in Africa, but Cape Point is a kilometer or two away and actually reaches further south than the Cape of Good Hope. 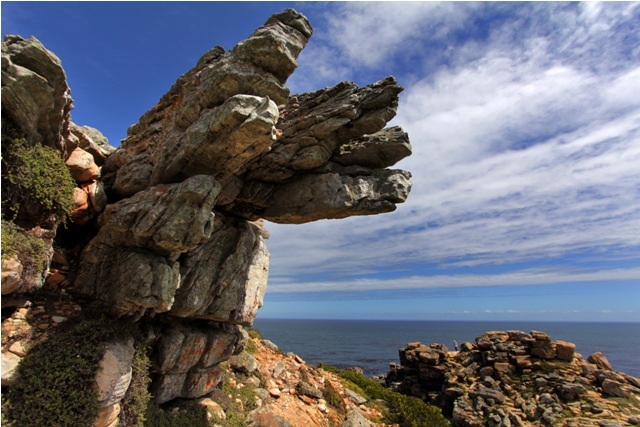 However, Cape Point is not the southern-most point in Africa — Cape Agulhas is. It’s all very confusing so I won’t get into it. Cape Point. Mom and I could’ve ridden the funicular up, but guess what? We walked. Time for the finale: a 13-kilometer bike ride back to the entrance of the Cape of Good Hope Nature Reserve. I was tired and secretly hoping this part of the tour would be called due to wind. It wasn’t. Mom is a serious cycler and took off in the front of the pack. (She was the oldest rider by at least two decades.) I hung back at first. A few kilometers from the gate to the reserve, Alexi was waiting with the cute van. “There’s a huge hill coming up,” he called. “You can stop here if you want.” I waved him off. I know what you’re thinking, and no, I don’t learn. I saw what Alexi meant when I rounded the bend. The “hill” was a mountain. Suddenly the wind was blowing sideways. I slowed down and kept my eyes on the beautiful blue water. I thought about how embarrassed I would feel if the cute van had to come rescue me from the side of the road. After a very long time, I crested the hill and coasted to the gate. Mom and the the Brazilians followed a few minutes later — everyone else had taken Alexi’s hint before the hill. 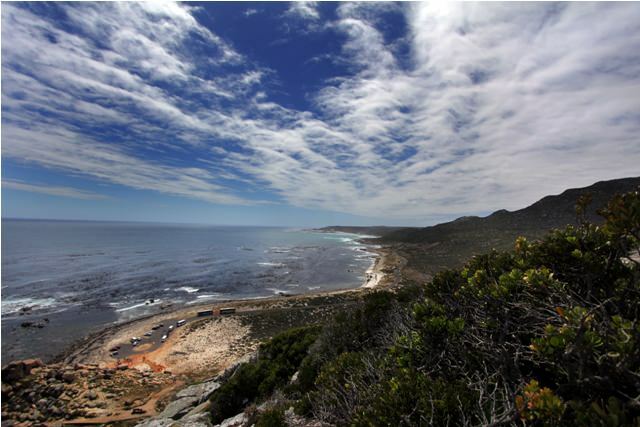 This photo has nothing to do with the bike ride — it’s another view from the Cape of Good Hope. But I don’t have any pics from the bike ride and was looking for an excuse to use this one. We arrived in Cape Town around 6:00. Mom and I were the last people left in the van. We asked Alexi to drop us at Miller’s Thumb, a restaurant down the street from our guest house that, according to Joe, serves the best food in town. I can’t remember what I ate — it was some kind of fish with a delicious sauce that had litchis in it. 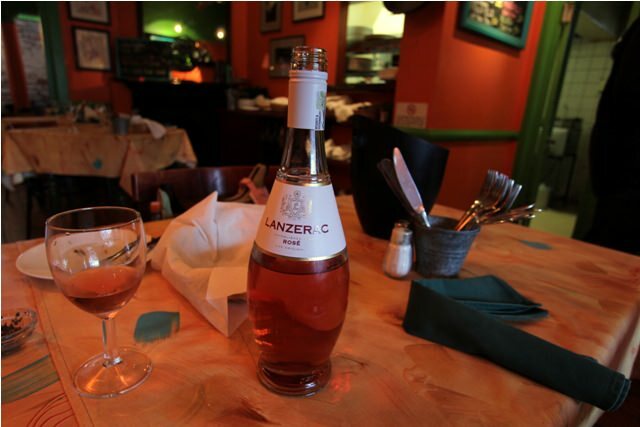 But I do remember the wine — a South African rosé on special for R85. I took a photo because it was so well-deserved. Next up: Cape Town odds and ends.